I love Christmas time in San Francisco because the city outlines itself with beautiful holidays lights. The Transamerica Beacon lights its beacon, a star at the top of its pointy roof. 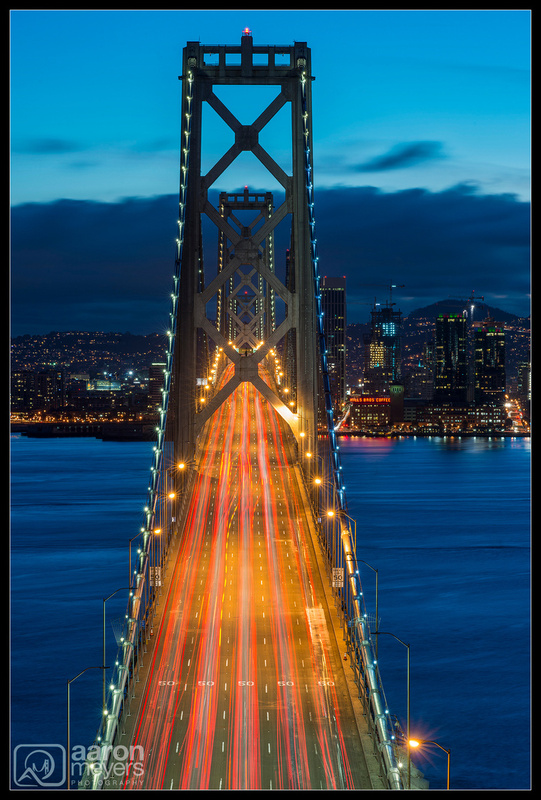 Ive photographed the city from under the Bay Bridge but Ive always also wanted to photograph it from above the bridge. While waiting for the Beacon to turn on I decided to grab my big lens and take a few shots of the Bay Bridge, all by itself. I love the way the cars travel below and the long exposure captures their red tail-lights and yellow turn signals. As soon as I was done snapping this photo I had to change lenses and race to capture a wider view of this scene before it got too dark and the beauty of the city faded into night-time.